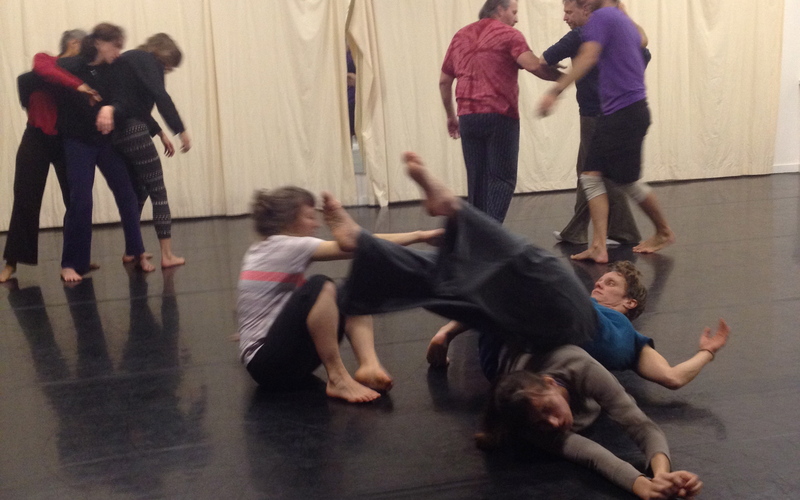 Every Monday night, for over six years, about a dozen dancers gather in West Seattle and explore Contact Improvisation together. They call themselves the Seattle CI Lab, and for the last two and a half years, I have been one of them. As the name implies, the Lab is a space for experimentation, analysis, and inquiry. Each week a different member of the Lab leads the group in a set of explorations that address a pre-agreed upon theme, and each theme spans six to eight weeks. While a few address physical skills, most tend toward the “physical, spiritual, psychological terrain that surfaces when we move together,” as member Louis Gervais puts it. 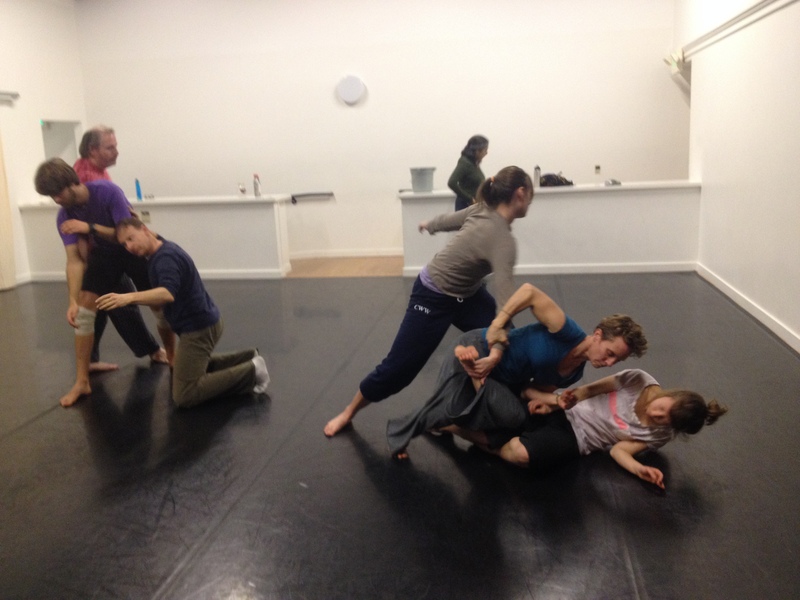 “Contact Improvisation is for me a spiritual practice, as rich and deep as yoga or t’ai chi. There is so much to explore and there is no way to do it alone.” Another member, Lisa Lightner, notes that it’s also “a theoretical exploration—we strive towards documenting our ideas and exercises and try to deconstruct intellectually what we experience in our bodies.” For me, Contact is an access point to my creative brain, the place where my intuition takes over the logistics of the dance. Lab is a structure in which I can begin to process that phenomenon and apply it to my artistic process. It would be hard to cover here exactly what happens during a Lab. Generally, there is a warm up, a directed experiment or exploration, a time of reflection/discussion, and then some open dancing that initiates from the evening’s discoveries. Usually someone brings snacks, too. As for themes, we spent one entire summer investigating each stage of Nancy Stark Smith’s Underscore improvisation structure. There is still lively debate about exactly what the Gap is. A state of mind? A place between places? A place of physical or of mental disorientation? Last January we used non-violent communication techniques to discuss with our duet partner all the inner dialogue that runs through our head during the course of a duet—for me that often sounded like: I’m not making interesting choices and my partner finds me boring. Or Are they nervous to give me weight? Or When I dance with this person I always think of waves and the ocean. It felt good to be open about my hopes, fears, and associations, and I also learned how other people experience dancing with me. The Lab format provides a CI experience that’s harder to get in a class or at a jam. It differs from a class because there is shared and equal leadership, and each member is active in shaping the direction they want the Lab to go. In the course of an evening, we often create limitations and rules that we end up breaking by the end. It’s part of the constantly evolving creature that is formed from its members—people who come to Contact for different reasons and with different backgrounds and abilities. Lab is also different from the traditional Jam format in that it provides an infrastructure to explore specific ideas through Contact in a safe, contained environment. Everyone is accustomed to working together and is onboard with following the lead of that week’s facilitator. This has allowed us to explore subjects not traditionally in CI’s sphere. For instance, we spent one fall exploring Ensemble—bringing awareness not just to people with whom you’re in contact, but with the entire room at once. Expanding on the CI concept of “listening,” each person made decisions in response to the other ideas and energies in the room. This organically led to compositional elements, which are not usually a focus in CI. I find the dances we make now are still reflecting the work we did as an ensemble. Often, when I remove myself to witness the group, I think, This is more interesting than most of the performance I’ve seen this year, and most of these people don’t identify as performers. The one element of the Lab that makes all this possible is also the most controversial. It’s a closed group, which can be hard to reconcile with the inclusive values fundamental to CI. We agree that having a trusting, committed, and focused group is essential to the research and allows us to build on previous explorations, but the uneasy feeling of exclusion is hard to shake. Realistically, there is space for only so many people in the modestly sized Grassroots studio, and when there is an opening, new membership is a touchy subject. Due to the nature of communal leadership, it’s a messy process to sort out the many strongly held opinions of the group. Does the spot go to the person who’s been most persistent? Or the one with the most experience? Or something less calculable? It’s an issue we have yet to resolve, but all are in agreement that we want to make our research more available to the dance community at large. This is the reason I write this article. From now through February 12, we will be bringing the Lab experience to the public through Velocity Dance Center’s Investigative Movement Practice series. Weekly sessions, held on Wednesday evenings, will feature one of a few themes chosen from some of our past favorites and led by a different member of the Lab. While the group will undoubtedly be different each week and the experience levels will range, it is our hope that bringing our methodologies into the open will spark deeper inquiry and interest in this form that we so love. For us, working with new bodies, minds, and experiences will only deepen our research and provide more data points from which to consider the ever-evolving nature of improvisational dance. Join the Seattle CI Lab on Wednesday nights in Velocity’s Kawasaki Studio from 6:00pm-8:00pm, January 8 through February 12. $15 drop-in or $60 for the session. Find out more about the Investigative Movement Practice series through Velocity’s Website. You can also read some of the Lab’s research on our sporadically updated blog: seattlecilab.blogspot.com.